Although Tottenham go into the game with a slim advantage Chelsea will seek confidence in Spurs' depleted side. Chelsea host Tottenham Hotspur at Stamford Bridge in their second-leg of the Carabao Cup semi-final clash. Harry Kane's penalty has given Spurs a slender lead going into the match at The Bridge. However, the Blues will be full of confidence knowing the long list of absentees which has left Mauricio Pochettino's down to the bare downs. A penalty which was awarded through the assistance of VAR helped Spurs to take the advantage to Stamford Bridge. After being brought down by Kepa Arrizabalaga, Harry Kane calmly rifled the spot-kick beyond the rooted Spaniard. 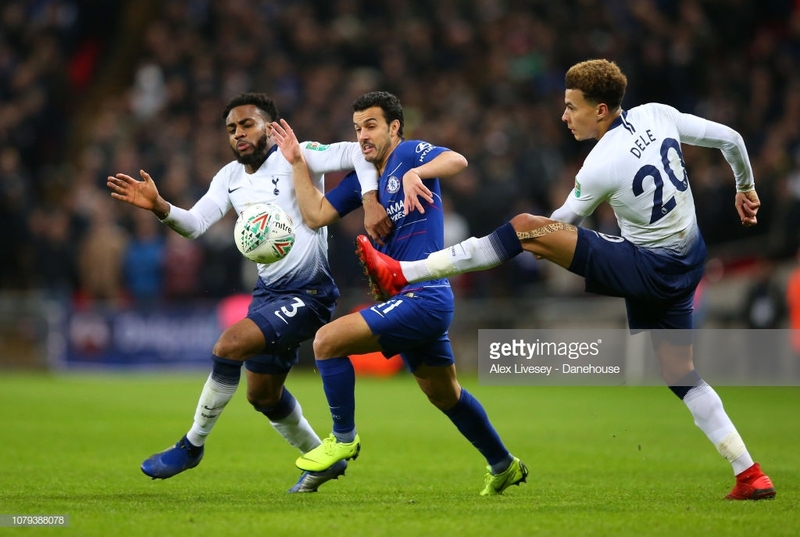 Chelsea enjoyed the majority of the possession throughout the game and looked the most likely to score the second goal of the evening, however, Spurs hung on. Maurizio Sarri will hope his side can show improvement from their 2-0 defeat away to Arsenal on the weekend. The Italian boss publically branded his squad as 'hard to motivate' following the defeat. As for the Lilywhites, they may still be running on adrenaline after Harry Winks secured them all three points away to Fulham with 15 seconds left on the clock. Tottenham go into the game with the following players absent; Harry Kane, Dele Alli, Heung-min Son, however, Moussa Sissoko and Lucas Moura are both in contention to feature. Many have called it a crisis at Spurs, their top four leading goal scorers all out through injuries and Son due to international duty. To rub salt into the wound these are not just short-term injuries as both Kane and Dele are not set to return to training until March. With huge games coming up, will Daniel Levy stun the Tottenham faithful and invest this transfer window or will Spurs become the first Premier League side to not buy anyone over a whole season? As for Sarri's men, Ruben Loftus-Cheek remains their only main injury woe and new signing Gonzalo Higuain was not signed in time to play against the Lilywhites. Both sides will be desperate for cup success this season, with the two Londoners being ruled out of the Premier League title race. Pochettino's men are trying are looking to end their 10-year drought without a trophy after the Lilywhites fell short in the 2015 League Cup final. However, Chelsea have the pedigree of lifting silverware even in the seasons where they do not produce in the league - last season being a prime example. The Blues finished fifth in the Premier League but were able to lift the FA Cup after beating Manchester United in the final. The only thing missing from Pochettino's impressive Spurs reign is a trophy and Thursday's London derby provides them with the perfect opportunity to reach the final where they will almost certainly play Manchester City.